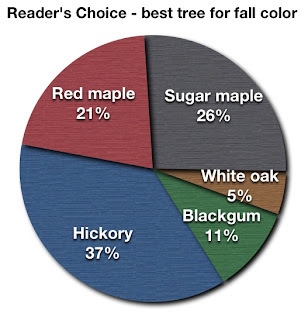 Our poll ends with Hickory receiving the most votes for best fall color in Atlanta. Second place is awarded to Sugar maples for their yellow and orange displays. Red maple came in third, noted for its variety of reds, purples, and golds. • Lee Reisch at the Hickory Record. • Even the Canadians agree. Walter Reeves answers a question about planting Japanese maple seeds. 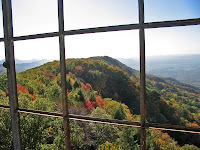 Fall color is soon to reach its peak here in Atlanta, judging from this article at The Franklin Press Online (NC). The Georgia Arborist Association has announced a new workshop for municipal government staff: Tree Maintenance for Local Governments. The course will be taught by Connie Head of Technical Forestry Services, and is scheduled for Friday, October 24, 2008. This offering will be for municipal staff only. Topics will include: Tree Biology, Tree Protection, Pruning, Tree Planting, and basic hazard evaluation. Lunch included! Contact the GAA for more information or call 770-749-0444. Puzzled by the staggering legions of oaks, hickories, and little shrubby things in Atlanta's forests, nature enthusiasts and professional arborists alike have been caught more than once scratching heads and cramping necks in an attempt to identify a favorite tree. Trees of Georgia and Adjacent States, by Brown and Kirkman, has been helping would-be-dendrologists solve this problem for decades. It is a well researched, crisp tome, that is also easily digested. The book succeeds because it has one major goal: to serve as a resource in identifying the species of native trees and woody plants in Georgia and the Southeastern US. New research shows that trees can reduce emissions of dust, ammonia, and odors near poultry farms. In some cases, the emissions were cut by almost half. The study was presented at the 236th National Meeting of the American Chemical Society (ACS). The report suggests that planting vegetation could reduce ammonia and particulates that degrade air and water quality. Research began in 2000, when residents near poultry farms in Maryland and Virginia complained about nasty odors from chicken houses. The research lead, Dr. George W. Malone of the University of Delaware said "We were aware of the concerns locally. We looked at what we could do to address them and the whole area of air quality as it relates to the emission of ammonia from poultry houses." Researchers proposed planting trees to serve as a filter. In this six-year study, Malone found that a three-row plot of trees of various species and sizes reduced total dust by 56%, ammonia 53%, and odor 18%.